If someone would ask me for the way from the main intersection in Shaykh Maskin’s to the north eastern hill where the Brigade 82 headquarters are based, I could probably give him directions without ever having been in the city or even the country. Moreover, I would be able to tell him, until what point he would be moving in rebel territory and at which street, he would have to choose whether to take cover or run over to the Assad regime side… No one will ever ask me and I won’t give directions. 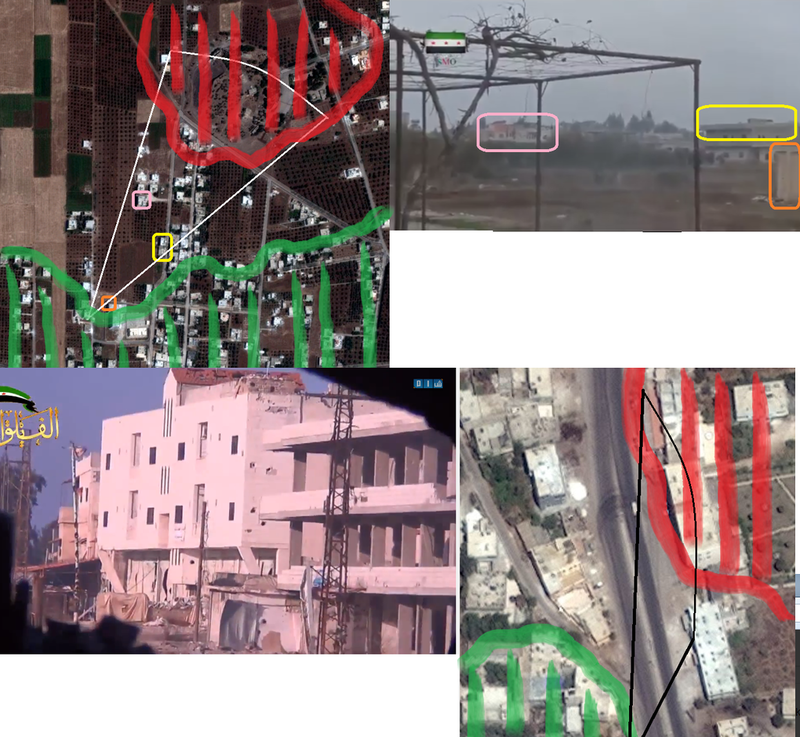 The point I want to make is that by reviewing multiple video angles of the town from recent rebel footage and comparing these with google maps and bing maps satellite images, I got able to tell, who is watching from which point into which direction and what this means for the viewer and the sighted objects. When it comes to reporting on war, this analytical process, called geolocating, can turn out to be extraordinarily important as it allows to determine fighting action on the meter exactly, without relying on reports of either side of the conflict, whitewashing their “facts” in their particular favor in 99% of all cases (no offense as perfectly understandable). Moreover, it allows to follow conflicts closely and report on their progression, without risking one’s life. This becomes particularly interesting, talking about conflict zones, far too dangerous to send in neutral journalists. 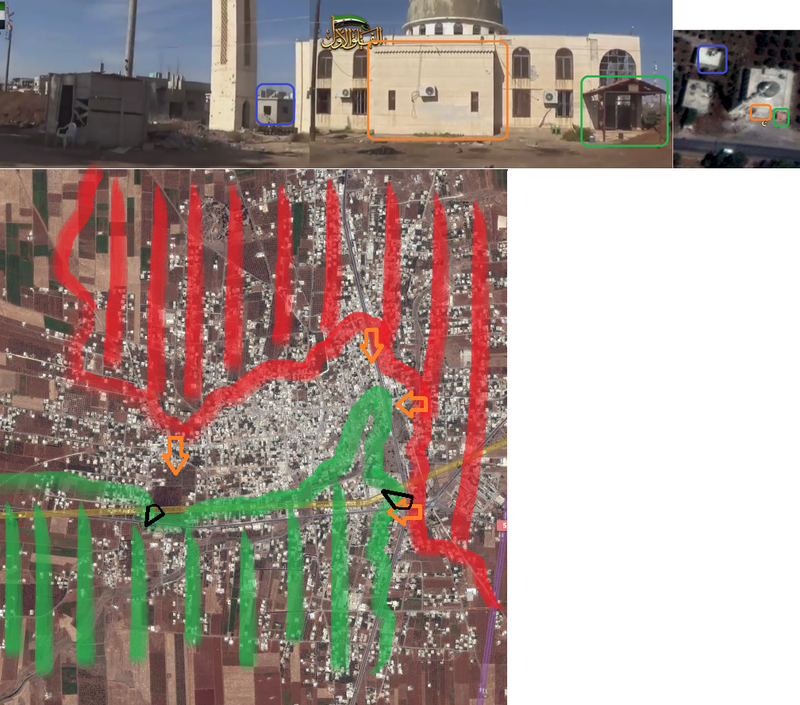 Coming back to the Battle of Shaykh Maskin, this fight serves as a perfect example for tracking frontline developments in an urban warfare situation from social media footage. 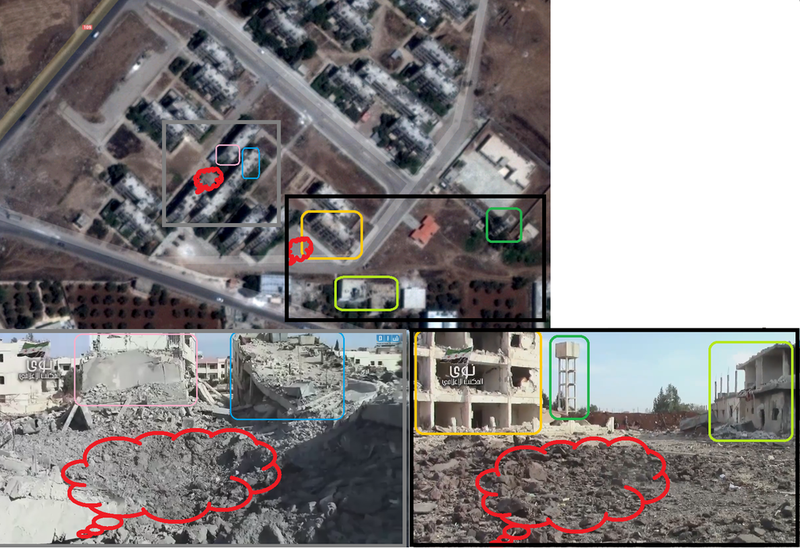 I will describe how the battle proceeded, solely using my analyzed and geolocated rebel videos over the last 7 weeks. Altogether, I included some 200 videos from 15 rebel factions, ranging from Free Syrian Army brigades over moderate islamists from the Islamic Front to islamist fighters from Jabhat al Nusra, often described as a local branch of al-Qaeda. 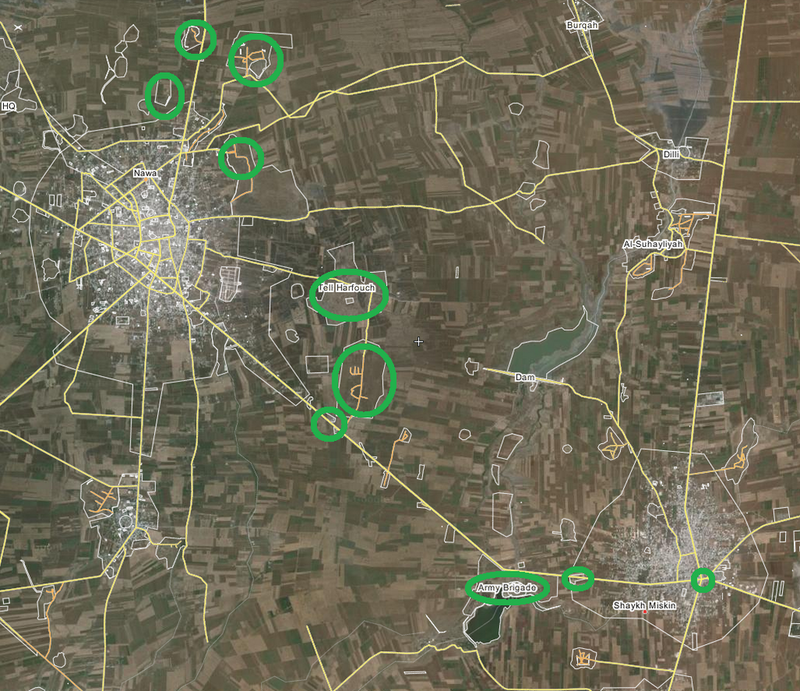 In late October, Syrian rebels started their offensive on the Assad regime-held bases east of Nawa, resulting in the capture of at least 9 military installation between Nawa and Shaykh Maskin. These victories paved the way for the start of the offensive on the regime stronghold of Shaykh Maskin itself. While Nawa is the second biggest town in Daraa province, however not extremely strategically important beside that fact, Shaykh Maskin is the last regime-held city before the highway M5, which connects regime-held Daraa city with the greater Damascus area. 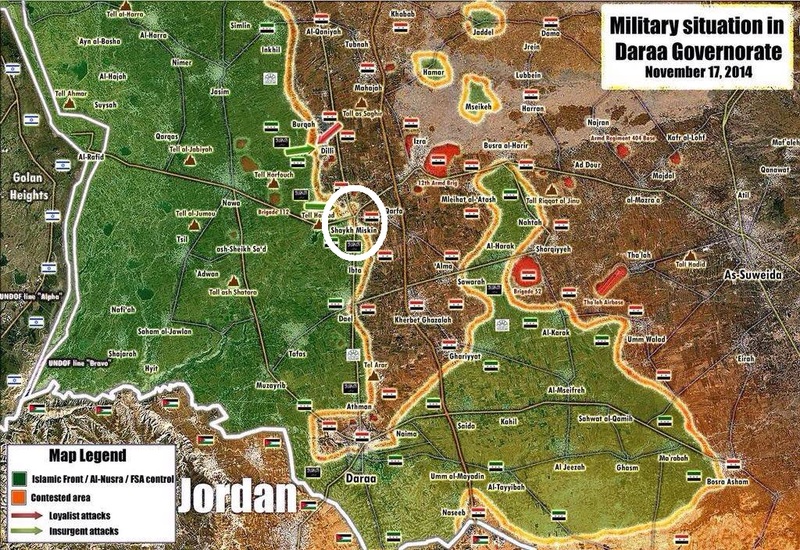 If it falls, Daraa city would be under threat of becoming besieged by rebels, which would result in the toal collapse of the Assad regime rule over its southern region. The battle started November 1st, when rebels attacked the west and south west of the city. Due to the recent regime losses around Nawa, the defense of the city was weak and rebels forces needed only 5 days to occupy the entire south west. This enabled them tp launch an assault on the central intersection with the largest city mosque and main road barrier. Shortly after the intersection and mosque were taken, however the Assad regime started to send reinforcements, coming from the east and north, so nearby towns like Izraa, but presumably also Damascus itself. 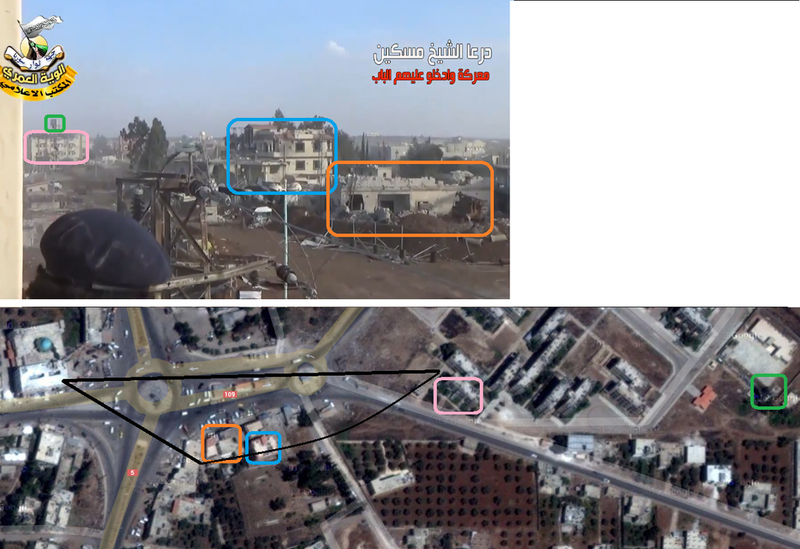 Shortly after, rebels were in pssession of the mosque, but didn’t control the intersection anymore, from which they started their assault. At the same time, rebels tried to advance north, attacking the Brigade 82 headquarters of the city. However, due to massive Assad regime reinforcements, strengthening the different Brigade 82 complexes in the city, the rebel army started to face a two-front war, being attacked from the housing complex of Brigade 82, located in the south east, as well as the headquarters of the Brigade, located in the north. Additionally, regime forces were pushing down the north-south road, coming from the north east of the city, where there are several towns and wide strips of land under Assad regime rule. At the same time, Assad air force jets bombed rebel forces as well as civilian areas in the city, making it extremely hard to advance for rebels and even letting them lose some of the before-held territory. In this situation, only something dramatic could save rebels from being entirely pushed out of the city and towards Nawa in the west. This dramatic change came, when strong reinforcements from the Jabhat al Nusra islamist extremist group arrived in the city in late November. They added what moderate rebels, using advanced weapons (like the Saudi-supplied TOW), needed to succeed: Manpower and “absolute devotion”, meaning the willingness to not just win and survive the battle, but also sacrifice for this goal as a tactical mean … talking of suicide car bombers. On December 7, two suicide bombers, using BMP ambulances rammed their vehicles into the Brigade 82 housing compley, destroying wide parts of the base. This massive attack did not only stop the regime’s assault from the east of the city. Furthermore, it enabled rebels to attack and take the housing complex, effectively returning to a one front war towards the northern parts of the city. The suicide bombings caused massive destruction, leading to the collapse of several of the Brigade 82 housing area barracks. Between 20 and 50 Assad troops died in the assault. The rest fled to Izraa and Garfah. Aftermatho of the double SVBIED attack. A short Assad army counteroffensive on December 8 coming from the S-E was fended off and within a couple of days, rebels were in a far better position, being now able to focus on the northern parts os the city. 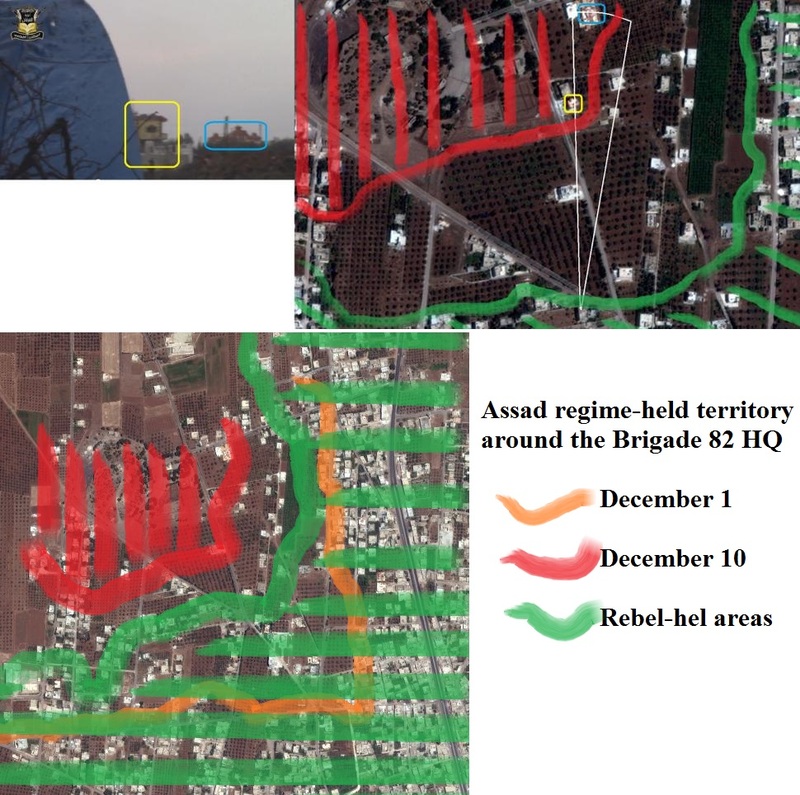 The two maps for comparison show the location of the two suicide BMP bombs as well as the directions of the rebel assault after victory in the south east. On December 9, the offensive on the Brigade 82 headquarters got intensified. Using small arms, mortars, but also ATGM and TOW, rebels launched hit after hit vs. regime troops, which were – and are – still resupplied from the north and the north east of the country. It becomes clear that no quick victory, like it was seen in the south east, is in sight in the north. Partly due to the superior position of Assad forces on the two heavily fortified hills, partly because Jabhat al Nusra seems to have withdrawn again from the battlefield, taking its 100+ men with them, leaving the offensive to not more than 300 FSA and moderate isalmist forces. Despite tough battles and very slow rebel advances, progress for rebel forces is visible and the chance of Assad bouncing back seems very small. On December 18, a number of videos appeared, making it possible to geolocate the current frontline in the city, slowly but continuously moving northward, indicating the liberation of another city from the grip of the Assad regime. At the same time, there is still heavy resistance from fanatic Assad-supportive troops, willing to risk everything for their loyalty to the country’s dictator. One indication of a long battle ahead is the – possible – recapture or eager hold on one high rising sniper position, very close to the center of the town. However the sooner or later coming total defeat of the regime in Shaykh Maskin does not mean an immediate ease for the inhabitants of the town as the Assad regime follows the policy of scorched earth, bombing all lost areas – from the air – even harder than during military engagements in the respective territories. The article at hand summarizes the footage analysis and locating work of more than 7 weeks. It shows that geolocating footage from ongoing battles and too-dangerous-to-enter war areas can lead to a deep understanding of the regarding conflicts in a journalistic as well as military-strategic respect. Therefore, I will continue using this instrument as a main tool of my work, trying to make sense of ongoing conflicts and describe them beyond “reported” or rather “claimed” and thus doubtful communiques from the involved actors on the ground. Last but not least, the battle for Shaykh Maskin is not over yet and I will consider writing a “part 2”, in case of decisive developments on the ground. All sources in my Twitter feed between November 5 and December 18. 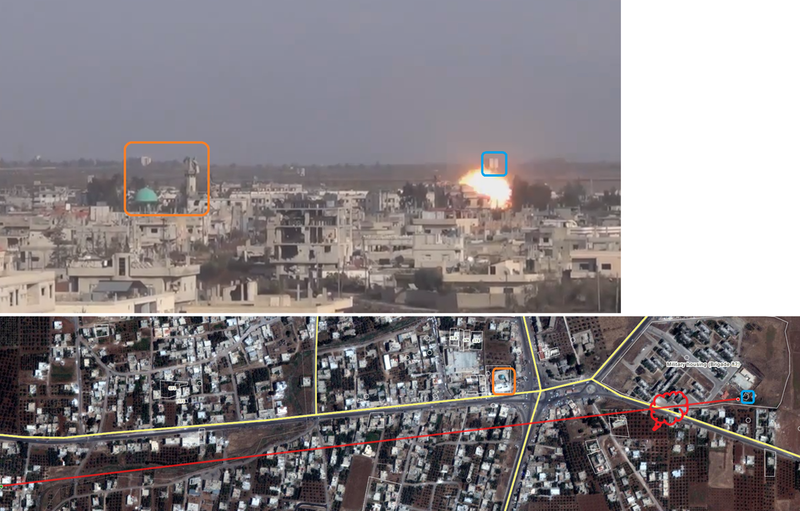 This entry was posted in Syria and tagged Daraa, Geolocation, Journalism, Shayk Maskin, Syria by Julian Röpcke. Bookmark the permalink. very nice. I have a feeling you went to Harvard. As always very good work on the analysis. Just a question how come you support illegal armed groups in Syria but you oppose them in Ukraine? 1. http://www.bbc.com/news/world-middle-east-30847689 -US training Syrian “rebels” just like Russia does in Ukraine. 2.http://www.wsj.com/articles/obama-proposes-500-million-to-aid-syrian-rebels-1403813486 and http://www.theguardian.com/world/2013/nov/07/syria-crisis-saudi-arabia-spend-millions-new-rebel-force –US and Saudi Arabia fund these guys just like Russia does in Ukraine. 4.http://syriahr.com/en/2015/01/the-syrian-human-rights-observatory-sohr-documented-the-death-of-4358-people-in-syria-in-december-2014/ — This December for the first time the foreigners had a higher number of KIA then the rebels them self. 5.Out of 200 000, 120 000 are government soldiers KIA which means the rebels are responsible for nearly 60% of the dead in Syria unlike some claims that Assad is responsible for the 200 000 dead.This also contradicts that Assad is not a popular leader because with out popular support you can not recruit. 6.http://syriahr.com/en/2015/01/jaysho-al-islam-carry-out-its-threat-43-rockets-rain-down-on-damascus/ — Just today these so called rebels fired 43 rockets on Damascus just like the Russians did yestarday in Mariupol. 7.The myth that ISIS is attracted to Assad is just a myth.Most of these guys entered “rebel” held areas and fought along side them.They led rebel offensives in Latakia in 2013 and Captured the Menagh base along with rebels. 9.http://www.washingtonpost.com/world/middle_east/until-last-month-this-ancestral-home-of-syrian-armenians-had-been-insulated-from-war/2014/04/02/84a97180-5224-40fc-bcdf-6920aae3a7ab_story.html — Turkey allowed the Syrian “rebels” to enter Syria in Kasab and shot down a jet just like the Russians did during the Novoazovs offensive. There you have 9 facts that are the same in both conflicts and yet you support different sides. Looking forward to your answer :). There is NO comparison between the legitimate demands of the people of Syria and Russia’s intervention in Ukraine. You can save your energy. Well those in Ukraine can say also its there legitimate demand but ok It was just a question I have been following these conflicts from the start and they seem pretty much the same to me :).